Most people using the internet are familiar with social media sites. However, many business owners haven’t yet started using these sites to form relationships with people that lead to increased business. Here are some smart ways to use social media to increase the bottom line of any business that wants to excel. Consider opening an account on the growing business oriented site LinkedIn. This site is designed for business professionals to communicate with one another and their customers. It has incredible features that include ways for satisfied customers to recommend you to others, increasing your reputation and credibility. You can also join conversations relevant to your business interests. Use the questions and answer feature of LinkedIn. LinkedIn’s Q&A works like a large discussion forum: look up questions related to your products or industry and write useful answers to them. You could also post a link to one of your articles if you do not have time to write something. Have your blog posts show directly on your LinkedIn page thanks to the blog feed application. You can post an article, and it will appear as LinkedIn updated. This will help you save time, and you should get more exposure by reaching out both to a blogging community and to your LinkedIn friends at the same time. 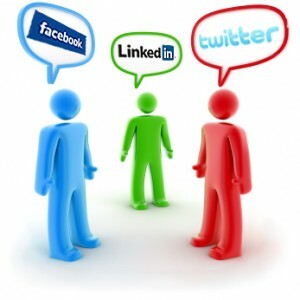 You can have your LinkedIn updates include what you post on Twitter by adding the Twitter application to your profile. Even if Twitter posts are generally shorter than LinkedIn updates, you will be able to reach out to a larger number of people and encourage your LinkedIn friends to find you on Twitter. Connect your blog to Linkedin by putting a share button at the top of the page. Because of its nature, Linkedin has users who are generally people with influence who have higher incomes, meaning plenty of potential customers with money to spend on your products and services. With more than 100 million people using Linkedin, it is a great opportunity using social media to market your business without spending a dime. To make sure your social marketing campaign is reaching your customers, find out where they congregate. Are many of them on Facebook or do they prefer Twitter? Depending on your niche, you might be better off looking at LinkedIn or even YouTube. Poll your customers and find out where they spend their internet hours. Pitch your tent there. Don’t sit back and let competitors take all your prospective customers. Use these tips to have a social media marketing strategy that is well thought-out as well as effective. Social media is a wonderful way to connect with others, whether used for personal things or as part of a real marketing plan.